Sleaford and North Hykeham’s MP, Dr Caroline Johnson took a defence minister on a tour of RAF College Cranwell in a bid to get the necessary repairs done to its decaying sporting facilities. The MP visited the RAF College on Thursday, September 13 with Minister for Defence People and Veterans, Tobias Ellwood, when they met with the Commandant, Air Commodore Pete Squires. During the visit he received an overview of the station and met officer cadets involved in an exercise. Dr Johnson had urged the minister to visit the airbase earlier this year when she raised issues of deteriorating facilities at the historic officer training establishment in the RAF’s 100th anniversary year, while in the House of Commons. She particularly raised concerns about the sports facilities, such as broken floodlights on the station’s astroturf pitch, which is used by both serving personnel and local residents. She received assurances during the ministerial visit that the lights would be fixed this financial year, that work to upgrade accommodation facilities is underway and that the minister would look into other facilities that require work including a broken diving board in the swimming pool and an out-of-commission assault course due to outstanding repairs. She had said that the physical fitness of servicemen and women is extremely important to fulfil their roles. Given the recent announcement of the closure of RAF Scampton, she also took the opportunity again to raise with the minister the future of the Red Arrows, and to make clear how important they are to the people of Lincolnshire. 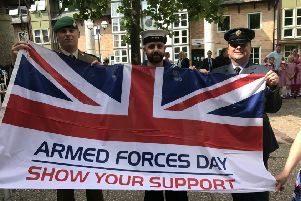 Commenting afterwards, Dr Johnson said: “Our brave serving personnel and their families sacrifice a great deal to keep us safe, so I believe it is only right to ensure that they have decent facilities where they are stationed. I am delighted that the pitch lights at RAF Cranwell will now be fixed, and that the minister has undertaken to look at what else needs doing.